This class represents an entire state of memory via a map of memory cells. The cells are indexed in the map using the hash of their symbolic virtual address, therefore querying using an address that is equal but structurally different will fail to find the cell. This memory state does not resolve aliasing. For instance, storing a value at virtual address esp + 24 and then querying ebp + 8 will always assume that they are two non-aliasing addresses unless ROSE is able to simplify one of the expressions to exactly match the other. Although this state has less precision than the list-based state (MemoryListState), it operatates in logorithmic time instead of linear time, and by using hashing it avoids a relatively expensive comparison of address expressions at each step. This class should not be confused with MemoryMap. The former is used by instruction semantics to represent the state of memory such as during data-flow, while the latter is a model for mapping concrete values to concrete addresses similar to how operating systems map parts of files into an address space. Definition at line 650 of file SymbolicSemantics2.h. Instantiates a new memory state having specified prototypical cells and value. Definition at line 681 of file SymbolicSemantics2.h. Instantiates a new memory state having specified prototypical value. 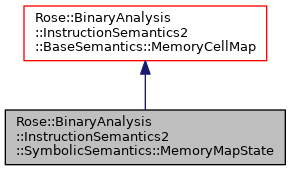 This constructor uses BaseSemantics::MemoryCell as the cell type. Definition at line 687 of file SymbolicSemantics2.h. Instantiates a new deep copy of an existing state. Definition at line 693 of file SymbolicSemantics2.h. Creates a memory state having specified prototypical value. This constructor uses BaseSemantics::MemoryCell as the cell type. Definition at line 702 of file SymbolicSemantics2.h. Creates a new memory state having specified prototypical cells and value. Definition at line 708 of file SymbolicSemantics2.h. Creates a new deep copy of this memory state. Definition at line 713 of file SymbolicSemantics2.h. Recasts a base pointer to a symbolic memory state. This is a checked cast that will fail if the specified pointer does not have a run-time type that is a SymbolicSemantics::MemoryMapState or subclass thereof. Definition at line 722 of file SymbolicSemantics2.h.